Heat oil in a pan, add mustard seed,urad dhal ,onion ,tomato, ginger garlic paste & saute few mins. Add chopped methi leaves, chilli powder,salt & cook until raw flavours extracts. Add cubed potatoes & mix well. wonderful combo..looking yummy and tempting. Next time I will definitely try adding tomato to aloo methi!! Delicious looking aloo. Perfect for rotis. Yummy aloo methi...Love to combine both aloo and methi, yet to try this combo! 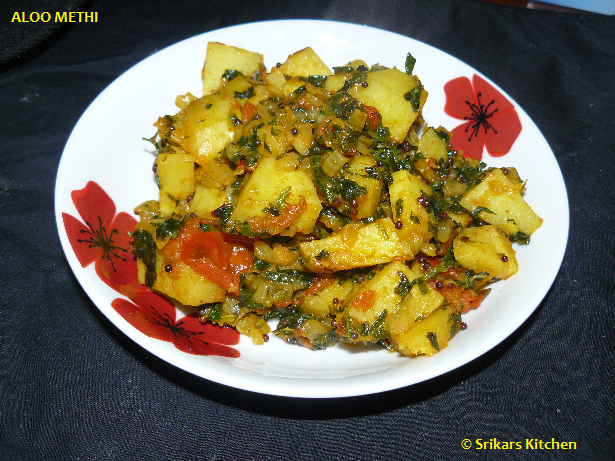 Yummy Alu methi..I love this combo,just that i dont add tomato..
Would love to hav ethis with rotis. There is something unique about aloo and methi that makes it such a unique and tasty combo. I love the presentation. Aloos go well with methi this makes a great side nice blend of colors!!! This is always a favourite. Aloo n methi make a delicious combo!